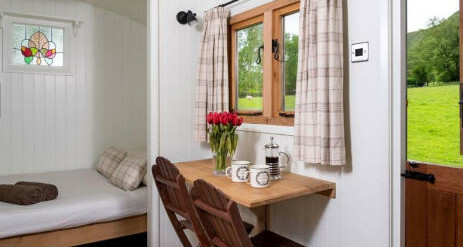 Sylvie’s Shepherds Hut near Hay on Wye in Herefordshire offers glamping in a field and up a hill (Rhos Fach). 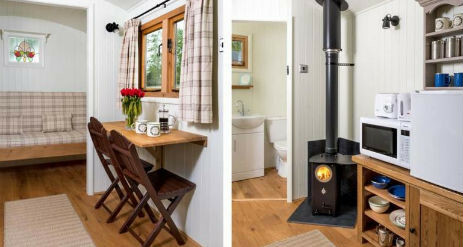 Set in the most glorious wild flower meadow with views up to the Black Mountains start the day refreshed and relaxed. This is a dream location for anyone interested in the most natural organic undisturbed Welsh countryside. 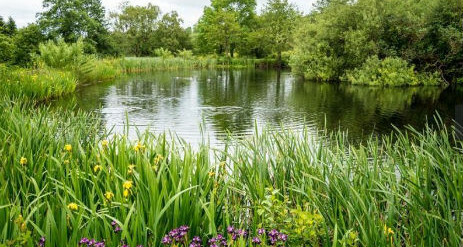 Only a few steps away is an absolutely magical private lake full of brown trout (fishing available by request). A few TV and radio programmes have been made here including one by Iolo Williams from Springwatch featuring the dawn chorus. The small holding is above the small market town of Talgarth and close to the Rhos Fawr Common with the uninterrupted views straight up to Pen Rhos Dirion. There are wonderful circular walks up over Mynydd Du Forest over to the picturesque Grwyne Fawr reservoir – all in The Black Mountains – really the lesser known area of the National Park. 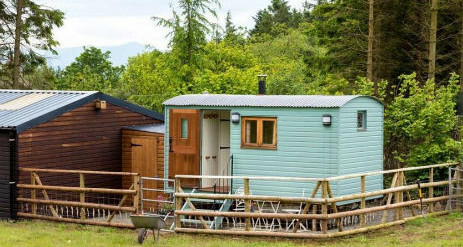 Located just 10 miles from Hay-on-Wye and 12 miles from Crickhowell Sylvie’s Shepherds Hut excellently placed to offer a huge number of outdoor activities all based locally. 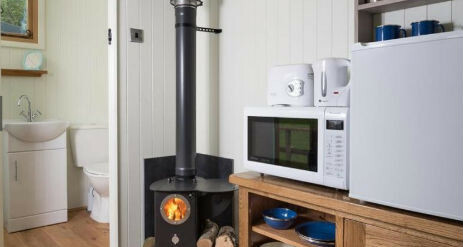 Walk straight from the house onto the Black Mountains or over toward the Brecon Beacons. There is fantastic canoeing on the River Wye or Usk and hang gliding on nearby Hay Bluff; as well as a superb gliding centre in Talgarth itself. Pony trekking, clay pigeon shooting, fishing and more advanced riding can all be arranged locally. 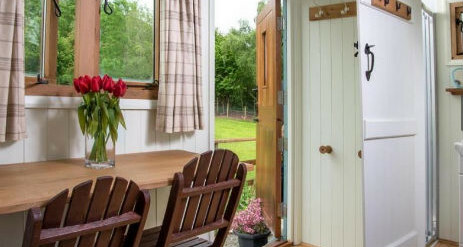 At the foothills of the beautiful Black Mountains and set within a site of Special Scientific Interest (SSI) on the common above Talgarth; the remote location offers wonderful walking straight from the door. Follow in the footsteps of the workmen of Talgarth who, a century ago, carved a footpath in the Black Mountains on their daily journeys to hew a new reservoir high in the mountains. A couple of miles across the common, where Red Kite soar above and sheep and wild ponies graze, is the ancient Llanilieu Church (this is a favourite of Prince Charles who visited recently).